David Wiseman LG is a contemporary landscape painter widely exhibited both here and internationally. He has work in numerous public and private collections worldwide, has won many awards, has completed a number of major public art works, and is a member of The London Group, the Arborealists and the National Acrylic Painters Association. 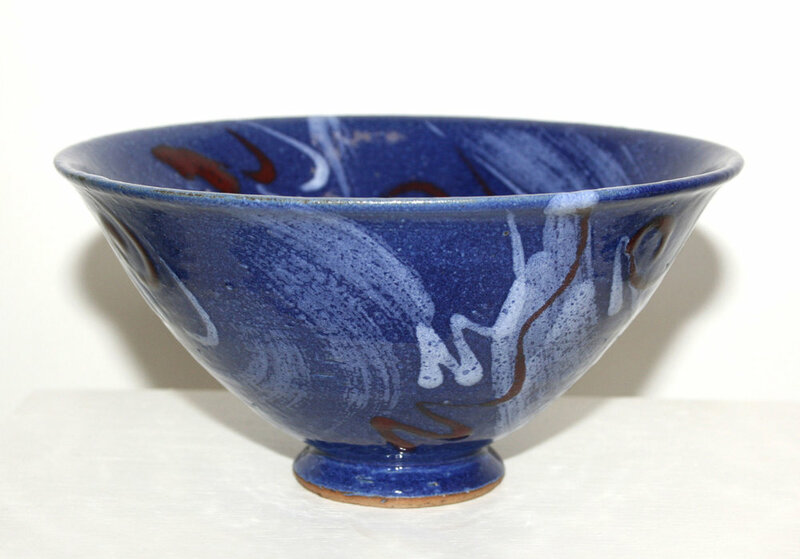 Betty Wiseman has been a potter and teacher since graduating from Farnham School of Art in 1971. She has exhibited widely since then and has worked from her studio in Perivale since 1985. Her work consists of thrown and handbuilt stoneware functional forms decorated with various coloured glazes. She is a member of London Potters. Lesley Bower SGFA is a much exhibited painter and mixed media artist working on canvas and paper. She is an elected member of the Society of Graphic Fine Artists. Lesley makes vibrant inventive abstracted interpretations of still life and city life. Karen Jorgensen is a potter of over 40 years experience. She studied ceramics at Harrow College and has taught pottery to a wide range of students including children, adults and those with disability. She makes stoneware and porcelain forms decorated with sprigging and lustre. Lesley Bower SGFA "Spring Flowers"